The high efficiency Gas Riva Vision Small and Midi stoves both sport an eye-catching glass-fronted door and integral glass plinth whilst featuring our latest highly realistic log effect fire. Both come with a choice of either standard or thermostatic remote control and are available as either conventional or balanced flue installations. 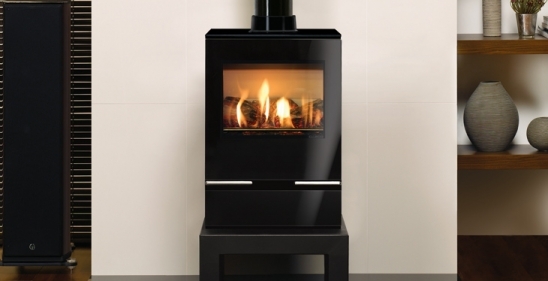 To further increase your interior design possibilities, why not also opt for a contemporary stove bench or gloss black flue pipe (conventional flue only) – the perfect complement to these stylish contemporary stoves.